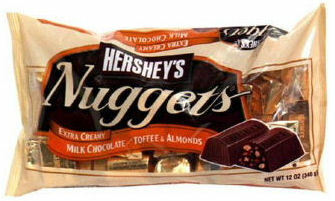 Hershey’s probably manufactures the most types of chocolate distributed under a ubiquitous name within one product line. And though I have tried most of them, I canâ€™t say I have a favorite. If I were forced to choose, probably the Hersheyâ€™s with Almonds bar, but that says a lot more about my affinity for almonds than it does about Hershey. Scanning the candy aisles as always, my attention landed on a bag of Hershey’s Nuggets. The bag advertised â€œExtra Creamy Milk Chocolate with Toffee and Almonds.â€ Hmmâ€¦ I thought. These sounded like the nugget form of the Hershey Symphony Bar, but I hadnâ€™t had one of those in ages, so I was willing to experiment. Plus, almonds and toffee are redeeming in their own right. These pieces are shaped like your standard nuggets. Each one has a refreshing chocolate aroma, signaling they haven’t been sitting on the shelf too long. The bite has a soft snap, but is firm with an easy chew. As soon as your teeth chomp down, youâ€™re hit with the varying textures of the almond pieces and toffee embedded within the chocolate. Itâ€™s not difficult to bite through, but the crunch factor is fantastic, adding a nice layer of sophistication to the piece. As far as taste is concerned, it depends on the piece. Some of the ones I bit into were more chocolate-oriented, some were bolder with the toffee. Either way, I didnâ€™t mind any of them. The toffee flavor is simple, but genuine in its composition, which works well in a chocolate medium, as opposed to toffee being covered in chocolate because you can still readily taste the chocolate in this instance. Like the name implies, it is creamy, but “extra” might be a stretch. It doesnâ€™t overwhelm the throat, resembling the creaminess of a European dairy milk bar. I donâ€™t feel a strong chocolate, already a potent base, bodes well with the alkali taste of toffee, so a creamy medium, as opposed to dark chocolate, succeeds best. The almonds are rather pulverized, and though detectable via crunch and flavor, are reserved overall. Personally, I would have enjoyed their presence being a tad stronger, but people who generally dislike nuts probably wonâ€™t mind their insertion in this instance because of their relegated supporting role. I have been quite vocal before with my dislike for American mainstream chocolate, particularly Hersheyâ€™s, but I have no problem admitting I delightedly ate the whole bag of these. Nice job Hershey.